Once upon a time, a lion lived in a forest as the king of that forest. The lion was served by a crow, a jackal and a tiger. One day, when they were roaming in the forest, they saw a huge camel in the forest. 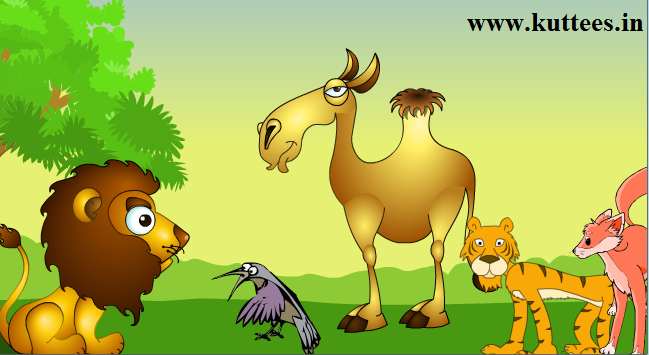 Since, the lion was seeing that camel for the first time, he asked his assistants to go and bring that camel to him. When the camel was brought in front of him, the lion asked camel, "You seem to be new in our forest. Who are you? and why have you come here?" The camel told his story about how he came came to that forest as a part of caravan from the nearby village and how he had lost his way. The lion felt very sad for that camel, but the cunning crow whispered "King, if we kill this animal, we all can eat him for several days", into the lion's ears. The lion replied, "No. We should not kill someone who had come seeking for hostage. Killing a guest is one of the worst sins in this world." Then the lion ordered his assistants to include that camel also to be a member in their team. Days passed by, one day the lion had a fight with an elephant, in which he was severely injured. The lion couldn't move anywhere away from its den. So he ordered his assistants to go and find a good prey for its meal. But the assistants could not find any animal. After coming back to the den, the camel again told the lion that if they kill that camel they could have food for many more days. The lion was not willing to kill the innocent camel. This time the cunning crow thought about a wicked plan to trap the camel. He told the lion, "Dear king, it is a sin only if we kill the guest. If the camel himself offers his life for you, then it is not a sin at all." The lion nodded his head in acceptance to what the crow said. The crow immediately, in a loud voice, said, "Since our king is starving without food. I request our king to have me for his meal. The one who lays his life for the lord will go to heaven". The camel believed the words of the crow were truth. He came forward and said, "Dear lord, the crow is a very small creature. Please take me as your meal. I will be very glad to give my life for you"
The tiger and the jackal, who already known about the crow's plan, were waiting for this moment. They immediately jumped over and killed the innocent camel. Poor camel died because he believed the wicked crow. MORAL: Be careful about wicked people.